Potential. Potential is the word that kept ringing through my head throughout the entirety of my last week with the MOGA Ace Power controller. From our very first whiffs of new of iOS 7 game controllers to now, the potential that these devices could have on the iOS gaming landscape seems almost unfathomable. I’m not sure we’re there yet, but the MOGA Ace Power is a very promising first entry into an ecosystem that I’m sure will be just as vast and varied as the rest of the iOS accessory world. My week with the MOGA was filled with some surprises, a few disappointments, and a whole lot of playing games that I didn’t previously enjoy that were given new life with a controller. 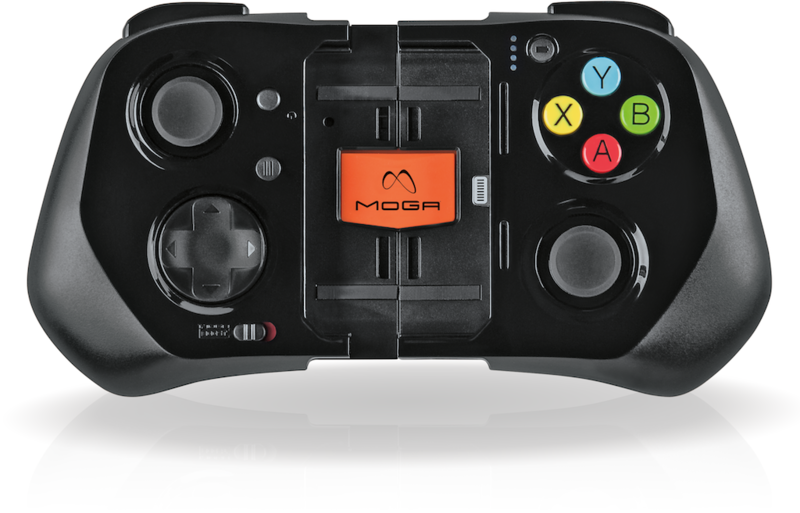 To back things up a bit, the MOGA Ace Power is a controller exclusively for non-iPad iOS devices with Lightning ports. It looks just like the leaked photos, and has all of the buttons we’ve come to expect through previous rumors. When not in use, it contracts via a sliding mechanism to be just a little bit smaller than your typical Xbox or Playstation controller. Using it is as simple as pulling the slider apart, lining up your iPhone or iPod touch with the Lightning connector, and stretching the left piece a little farther to lock the top of your iPhone or iPod touch in place. Since it connects via Lightning, there’s no configuration or other screwing around required. Once your device is in, it works in any game that supports it. Throughout the drip cycle of rumors of iOS 7 controllers we’ve discovered the additional functionality of these controllers that they’re also battery packs. The MOGA Ace Power works just like similar cases from Mophie, and has enough juice onboard to keep your iPhone charged while playing. There’s even a switch to enable and disable the charging functionality. This allows you to intelligently balance the battery between the two devices, letting you keep some juice in the controller to keep playing if your iPhone is already at a decent battery level. The biggest initial surprise of the MOGA Ace Power is that nearly all of the buttons are analog. Following rumors, and just how controllers typically work, I think we all expected the only analog controls to be the actual dual analog sticks themselves and maybe the outmost triggers. It turns out all of the buttons are analog. All of the triggers, the face buttons, even the D-Pad. In fact, the only non-analog gaming control on the whole thing is the pause button. However, with surprise comes disappointment, and the main source of that disappointment is how incredibly obvious to us that all of the developers out there releasing updates to add iOS 7 controller support are doing so without actually testing on a controller. For instance, Dead Trigger 2 (Free) comes with default sensitivity settings that were so high there’s no way any human could play that way. Similarly, LEGO Lord of the Rings ($4.99) has controller support, but you can only move using the D-Pad, not the analog stick. Strange little inconsistencies like that are everywhere, and I’ve yet to find a game that recognizes analog button presses. There’s also an odd divide between games that can use controllers and the platform they were originally designed for. Oceanhorn ($7.99), for instance, uses the controller but it seems like a vast majority of the game is played just using a single button and analog stick- Leaving the rest of the controller feeling weirdly unnecessary, especially when Oceanhorn is a game that worked so well on the touchscreen anyway. Games like Bastion ($4.99) that were originally built for controllers, however, are amazing when played with the MOGA Ace Power. All the clunkiness of the virtual controls fades away and you’re actually having fun instead of being frustrated that your right thumb migrated off a virtual button. Tactile feedback means so much in games like Bastion that it’s hard to go back playing it “normally" once I took my phone out of the MOGA Ace Power. Additionally, I’ve found myself actually enjoying playing first person shooters on my iPhone for the first time I can ever remember. All the frustration of having your thumbs all over the screen desperately trying to look and move while avoiding and/or hitting a plethora of virtual buttons just totally fades away. If you’re a huge fan of iOS first person shooters, consider one of these controllers an absolute must-have accessory. Even in the best games, rough edges are everywhere when using an iOS 7 controller. Virtual buttons still persist on screen regardless of whether or not you’re using a controller in most of the games I’ve tried. I’ve been the most excited for the potential of Bluetooth iOS 7 controllers, and having one that uses the Lightning port is vaguely disappointing because of the limitations it imposes. First off, the MOGA Ace Power only works with devices that can fit inside of its sliding mechanism, so iPads are out. Secondly, it eats up the Lightning port, and while this might not seem like that big of a deal initially, it kills the potential for using your iOS device as a game controller on a TV. The latency introduced through AirPlay is substantial, and I can’t imagine anyone playing a game on their TV via AirPlay using a controller for anything past the initial “Huh, well that’s neat," sensation. It’s “playable," in massive air quotes, but isn’t a great experience by any means. The MOGA Ace Power also has the annoying problem of not feeling like a $99 accessory. It’s very possible to make the argument that the functionality of the device vastly exceeds products like the similarly priced Mophie Juice Pack Air but our brains are already trained by console manufacturers who sell official controllers for half that when it comes to what to expect out of how a controller should feel and how it should be priced. The hollow feeling of the MOGA Ace Power, the clicky buttons, how little it weighs, the texture of the plastic and the loose rattle of the sliding mechanism when it’s not fully extended with an iPhone or iPod touch inside all work against the device feeling like a $99 piece of kit. It’s pedantic and nitpicky to be pointing out the texture of the plastic as “not feeling worth $99," but the point remains- It’s a lot like the impression a car leaves on you by the sound and feel of its door closing. Does the solid thump of a Lexus door closing make it better than the light weight feel of a Kia’s door closing? Probably not, but it all goes into the value judgement. Things get even worse when you compare the MOGA Ace Power to a Xbox 360 or PS3 controller, as both feel lightyears beyond the MOGA Ace Power in overall build quality in your hands- Doubly so when the MOGA Ace Power is in its limp and rattly closed form. Is it fair to make these comparisons? Probably not, but these sorts of controllers are the benchmark that we as gamers have been used to over the years, and while the MOGA Ace Power provides a step forward in functionality for iOS gamers, it feels like a step back in controller build quality. If this sounds overly negative, I really don’t mean it to be. iOS 7 controllers are in their infancy, and this is the very first one we’ve seen. Just like iOS devices themselves, these products are going to evolve and iterate over time, so it’s not much of a surprise that the MOGA Ace Power isn’t totally blowing my mind. It also doesn’t help that the software support isn’t really there yet aside from a few specific titles. Despite all this, the potential still feels enormous. The MOGA Ace Power has the standard button layout that all future iOS 7 controllers are going to have, so it’s not like there’s even many drawbacks of being an early adopter picking one up when they launch tomorrow at Apple Stores and online. It’s going to work with everything moving forward, although the hard Lightning connectivity and form factor requirements don’t have me very excited for the inevitable iPhone 6 refresh next year in the event that it doesn’t fit into the first wave of iOS 7 controllers we’re going to see. These are exciting times, and even though the MOGA Ace Power feels like a baby step into the iOS 7 controller world, it’s an important one, and I’m glad it’s here.